Sclerotherapy is a popular method for treating spider veins in the legs. 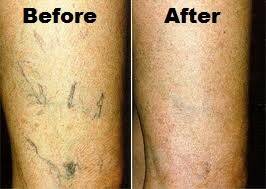 A few quick injections into the affected veins will allow the harsh appearance of the veins to fade from view. This quick procedure requires little down time for healing. Spider veins, or telangiectasias, are those tiny purple and red blood vessels found most commonly on the thighs or lower legs of women. They are hereditary and can form anywhere on the legs from the top of the thigh to the ankle. Our office has been using sclerotherapy with terrific results to treat patients' spider veins for over 25 years. Please speak with a staff member at Affiliated Dermatologists today at 973-267-0300 if you have any questions or to schedule an appointment!